I’ve always been puzzled and annoyed as to why certain foreign language films get distribution in Canada while other, often more deserving, movies, don’t, leaving filmgoers to catch them (if they can) at various film festivals and, sometimes, later on DVD. Claire Denis’s best films (Vendredi Soir, 35 Rhums) did not play commercially here (though they did in the U.S.) but one of her worst movies Bastards did. Similarly, Jan Troell’s very fine movie The Last Sentence, his spiky biography of anti-Nazi Swedish publisher, Torgny Segerstedt, only made the festival circuit while Force Majeure (Turist in its Swedish release) by Troell’s fellow Swede, Ruben Östlund, not only received a commercial release but is doing well at the box office. It’s even Sweden’s submission for the Best Foreign Language Film Oscar, which means it could get nominated and actually win that lofty prize. That would be unfortunate, as Force Majeure is one tiresome, irritating and ultimately trivial concoction, a movie that’s not nearly as smart or as meaningful as its creator, no doubt, considers it to be. In fact, if the title wasn’t already taken, I’d call it "Much Ado About Nothing." 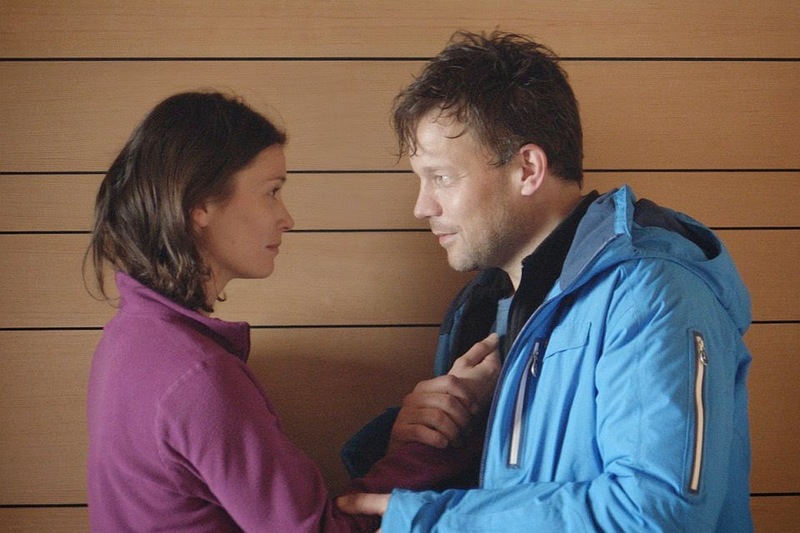 Force Majeure takes place during a skiing holiday, as a ‘typical’ Swedish family, Tomas (Johannes Bah Kuhnke), wife Ebba (Lisa Loven Kongsli) and their two kids, Vera and Harry (real life siblings Clara and Vincent Wettergren), enjoy the slopes and fresh air at a scenic French resort. But when it appears that their breakfast is about to be interrupted by an avalanche, Tomas panics and runs off without trying to save the kids or his spouse. Nobody actually gets hurt but the stage is now set for a dissection of the couple’s possibly unhappy marriage, as Ebba harps at Tomas and keeps trying to get him to admit he shouldn’t have lost it and fled while he, in turn, doesn’t remember what happened in the same way. That’s the whole plot of this increasingly trite movie, which becomes significantly less interesting and provocative as it unfolds. Even if you take the key scene in the movie – the potential avalanche - at face value as a test of one’s mettle, it’s really not enough to hang a movie on, particularly because Östlund isn’t a skilled enough director or writer to render this ostensibly moral / philosophical conundrum in any interesting or compelling way. (Claire’s Knee, this isn’t! Eric Rohmer’s French comedy about a man tempted to and torn by his wish to touch his hostess’ knee was consistently witty, smart and self aware about male / female differences.) It certainly doesn’t help that the two main characters are so off-putting. Yes, Tomas showed serious weakness at a crucial moment but you could make the argument that he assumed his family was immediately running from the avalanche, too, and would get out of harm’s way. In any case, it doesn’t mean he’s actually a coward, even if he is a bit of a jerk. But Ebba is so shrewish in her constant denunciation of her husband that you couldn’t take her side even if you wanted to. Besides, the kids aren’t at all angry at their dad’s flight, just terribly worried that their parents are going to divorce over this incident. And then Östlund, because he hasn’t dumped on the husband enough, offers up a very badly directed (and overacted) scene where a sobbing guilty Tomas confesses to all manner of other sins, just in case we don’t get that his fleeting moment of panic was symbolic of much deeper character flaws. (Give me a break.) Finally, feeling the need for some balancing of the scales between Tomas and Ebba, Östlund decides to put a ‘positive’ spin on his story, one that if it took place in an American movie, would get hooted down and laughed out of the theatre simply for being so contrived and fake. It also pretty much contradicts everything that has gone before, undoing its main premise by essentially denying it. It’s also proof that foreign films get away with murder, compared to the standard Hollywood model. 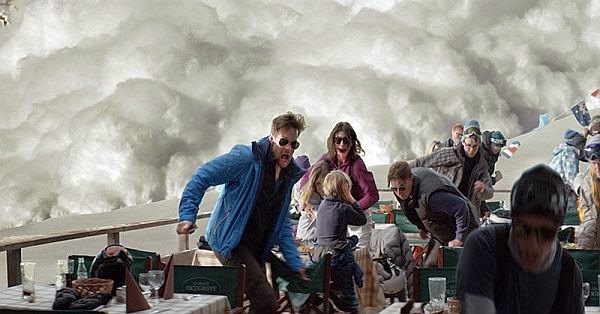 Did I mention that Force Majeure is supposed to be funny? At least, that’s how some reviewers are spinning it. (This film was ridiculously well reviewed.) But this specific type of deadpan comedy, where the characters don’t think they’re making a joke, reminds you of how much better, for one, Finnish director Aki Kaurismäki (Hamlet Goes Business, Calamari Union), early in his career, was at pulling it off. Force Majeure’s humour (?) merely consists of some dull discussions with Tomas and Ebba’s friends and acquaintances at the resort on whether Tomas is actually chickenshit or not, with the men, naturally, coming to different conclusions on the matter, none of which are particularly amusing. The movie is beautifully shot, largely in widescreen, by cinematographer Fredrik Wenzel and Östlund generates some suspense early on when you think another avalanche or calamity may occur, but as the two-hour film grinds on, that eventually dissipates, too, with the result that you’ll wonder why you ever wasted your time with these people. I kept thinking of how someone who’s actually experienced real tragedy in their lives would react to this movie about privileged ‘First World’ individuals and their supposed meaningful moral dilemmas and situations. Likely they’d see through it as the picayune project that it is. In that light, there are any number of movies, new or old, that are more worthy of your time. 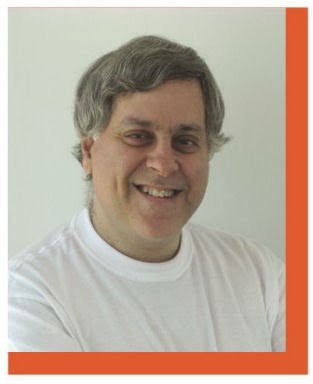 - Shlomo Schwartzberg is a film critic, teacher and arts journalist based in Toronto. He teaches regular film courses at the Miles Nadal Jewish Community Centre and Ryerson University's LIFE Institute, where he just finished teaching a course My Favourite Movies – And Why.